US destitution is different to that found in developing countries, given the prevalence of social safety nets and better access to services. However, there are similar factors keeping people in poverty, such as poverty traps and inefficient government intervention. Better social safety nets are an important part of reducing the difference. In my last blog post, I touched on Angus Deaton’s claim that 3-5 million Americans are “as destitute as the world’s poorest people”. When using comparable data for developed and developing countries, Kenny and Sandefur at the Centre for Global Development find that the true figure of Americans living in extreme poverty (below $1.90 a day) is actually closer to 230 thousand (compared to 268 million people living in extreme poverty in India alone). However, while there are many fewer Americans living in extreme poverty, is the nature of poverty they experience the same? Is it true that, as Deaton writes, “There are millions of Americans whose suffering, through material poverty and poor health, is as bad or worse than that of the people in Africa or in Asia”? This matters – Deaton argues we should “assist the truly destitute”, and by writing that a lot of Americans are just “as destitute as the world’s poorest people”, he is suggesting we shouldn’t prioritise the “faraway poor over the poor at home”. I previously argued this logic is flawed, as the US already spends a lot more on its domestic poor than abroad. I would now like to look at whether extreme poverty in the US and abroad is at all comparable. The comparison is difficult to make, as poverty in developing countries varies between and within countries, and similarly there is variation in the nature of poverty even within the US. However, there are some structural differences we can draw out. Social safety net support is much more widespread in the US. American households with near-zero income receive non-cash benefits that increase their consumption by about $20 a day on average. These households are not included in the 230,000 CGD figure of Americans living in extremer poverty, but are in Deaton’s figures. 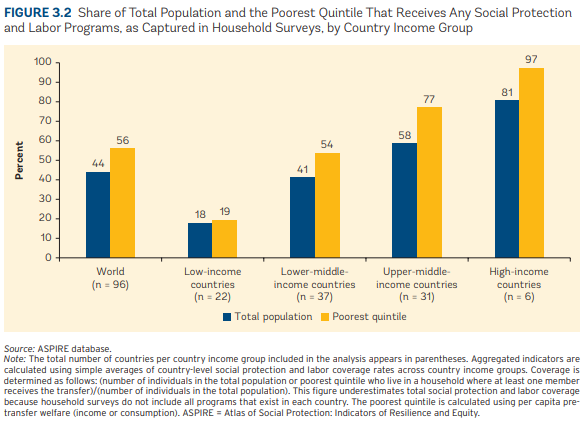 Furthermore, the World Bank Report on Social Safety Nets states that in high-income countries, 97% of the poorest 20% receive some social protection and labour programme, whereas in low-income countries, only 19% do (see chart above). People slip through the net regardless – homeless people freezing in the Winter in the US for example – but this is a large difference. Partly because of social safety nets, the extremes of poverty are probably different. As Deaton himself writes about rich countries, “With only a few (and usually scandalous) exceptions, water is safe to drink, food is safe to eat, sanitation is universal, and some sort of medical care is available to everyone”. While being poor in the US is certainly a miserable situation, you are less likely to e.g. starve or die in childbirth. There are exceptions – US stunting for children under 5 is higher than its extreme poverty rate, at 2.1%, compared to an at the most 1% extreme poverty rate, if you take Deaton’s figures. This compares to 35.2% stunting in low-income countries where the extreme poverty rate is 46.9%. Access to services is better. In the US, access for the poorest is theoretically almost universal, as Medicaid provides free health insurance to 74 million low-income and disabled people. Services are probably also better: a paper from 2006 states that high-income countries spend about 100 times more on health per capita than low-income countries (US$3039 versus US$30). In comparison, access to healthcare is considerably lower in developing countries. What about the other side of the debate? The above arguments may not apply to some of the extreme poor in the US, for example if they live in rural areas with low access to services, or possibly are not receiving welfare. There are already strict work requirements on federal food assistance and cash welfare, and are being phased in for Medicaid, likely reducing the number of beneficiaries. And regardless, living in poverty in the US is miserable. The book Evicted by Matthew Desmond is informative in this regard. In the ethnography, Desmond follows landlords, and eight families experiencing evictions. Reading it, I was struck by some themes that are similar to what is taught in classic development literature, and so I would like to now look at the other side, and draw out some similarities in the factors keeping people in poverty. Being poor tends to keep you poor. A central tenet of development economics is the concept of poverty traps, where for example a labourer who gets sick cannot earn the necessary money to buy food or medicine, and so gets “trapped” in destitution. Similarly, the rent for apartments available to Desmond’s families cost up to 80% of their income, meaning they tend to miss payments and get evicted, which traps them in poverty as they are “always starting over from scratch, losing their possessions in the chaos of removal, or putting them in storage and losing them when they can’t pay the fees”. The implication of this is that one-off infusions of cash and/or support can be quite effective. Poverty comes from, and with, a lack of power: development economics worries about loan sharks exploiting poor people who can’t access formal loans (a lack of power), or politicians abusing their powers as the votes of poor people can be bought more cheaply. 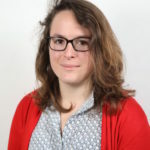 Similarly, Desmond’s families can’t call the police when experiencing domestic violence, or complain about the state of their apartments, as they risk being evicted if they cause trouble – being perennially behind on rent is sufficient for the landlord to evict them if they cause any trouble. Landlords profit off this, making high incomes “made possible by the extreme poverty of the tenants, who are afraid to complain and lack any form of legal representation.” The implication of this is that empowering poor people may be more important than giving aid, and to consider power dimensions when trying to help people. There is a need for high-quality government intervention. Because governments can shape policy aside from having big budgets, what they do generally matters more than what any individual charity can achieve. In development economics, aid used to be tied to policy conditions for this reason, and one mainstream line of thought is that bad governance is the bottleneck to inclusive economic growth. Similarly, in the US, policies such as housing assistance matter: currently only one in four of those eligible receive any, but affordable housing spending ($46bn) represents less than a quarter of tax relief on housing costs for American homeowners ($195bn). I’ve now reviewed some arguments for why poverty in the U.S. differs from that in developing countries, and in what ways its causes might be similar. It’s very difficult to make a direct comparison. Personally, I think the safety net aspect is important: while the U.S. has some way to go to ensure everyone is covered, developing countries’ nets have bigger gaps. They can help get recipients out of poverty traps. And in fact, safety nets make a significant dent in poverty rates: the World Bank reports that conservatively estimated, Social Safety Net transfers reduce the incidence of absolute poverty by 36%, and are reducing the absolute poverty gap (between income and the poverty line) by 45%. The newly published ASPIRE database is a great repository of data on this. Once developing countries manage to set up viable safety nets, the differences will likely narrow significantly.